Saverio Proto (ZioPRoTo) has the released the olsr OBAMP plugin, that was a freifunk project for the Google Summer Of Code. 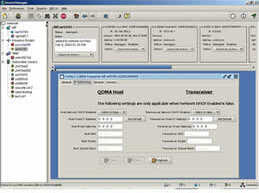 The OBAMP plugin allows multicast traffic to be forwarded in a OLSR mesh network. OBAMP is an overlay protocol. It first makes a mesh network with overlay links (udp tunnels) between the OBAMP nodes, and then it creates a distribution spanning tree over these mesh links. 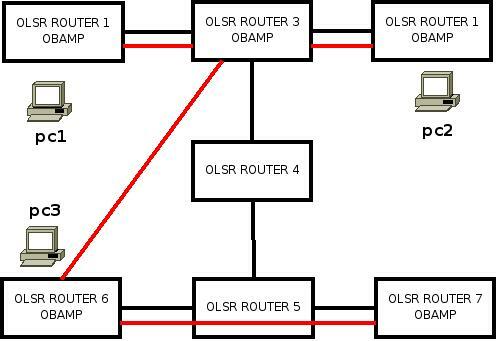 This version of the OBAMP protocol, implemented as an OLSR plugin, is a simplified one for Wireless Community Networks, where we assume the nodes to be in fixed positions on the roof of the houses. Protocol features regarding mobility have not been implemented (yet). OBAMP nodes generate OLSR OBAMP_ALIVE messages, these OLSR messages are forwarded in the whole network (also by the nodes that do not understand OBAMP thanks to the OLSR design). Because of the flooding mechanism every OBAMP node has a complete list of all the other OBAMP nodes in the mesh network. Every OBAMP node listens on the UDP port 6226 for OBAMP signalling. The OBAMP nodes will capture the multicast udp traffic from the non-OLSR interfaces, and will forward this traffic encapsulated in the UDP tunnels of the distribution tree. The other OBAMP nodes will forward the traffic in the tree and will decapsulate it on their non-OLSR interfaces. To avoid duplicated packets the data is carried into OBAMP_DATA messages, that are identified by a sequence number, and the OBAMP source node where the traffic has been encapsulated. Thanks for this great result of the summer. Special thanks also to Nino from ninux.org who was the mentor for this projet. The OpenWrt team (Cph) has announced a new version of its Linux distribution for embedded wireless devices named "OpenWrt Kamikaze 808 Release". I talked to Felix Fietkau already at the WCW. Unfortunately we did not have the time to do an interview at the end. But Cyrus from freifunk Halle gave a short showcase of his interface (in German). The OpenWrt team was also impressed by it and they now announce the enclosure of the Luci interface officially. Congratulations Cyrus! It has been quite a while since OpenWrt had a new Kamikaze release. The developer team has decided that it is time to get things straight and focus on a new release. This release have the official name: OpenWrt Kamikaze 808 Release. *Last day in July – final release candidate: 808 RC-1 808 RC-1 will be a feature freeze, and all changes after this point will be bug fixes. *Last day in August – final release: OpenWrt Kamikaze 808 Release. A couple of weeks ago I was talking with Alex about meshlium. I found out more about the project now. Last week I did an interview with Jose Luis Marina from Peopleware at a workshop of FOSS Bridge in Hanoi. Peopleware develops Osmius a very advanced monitoring tool to monitor all kinds of devices. He told me about their idea of using the open Squidbee hardware for their sensor networks. They want to be able to transfer data from sensor networks in an easy and affordable way. A scenario I see here is to use mesh networks for the transmission. Behind the project is Libelium Comunicaciones Distribuidas, a SpinOff company of the University of Zaragoza (Spain) which has develop the ZigBee communication module. The Libelium team is formed by Marcos Yarza, Alicia Asín and David Gascón. The board has been developed by the Arduino team by David Cuartielles, Massimo Banzi, David A.Mellis and Tom Igoe. They come from different institutions in Spain, Sweden, Italy and New York (compare: http://www.libelium.com/squidbee/index.php?title=Who_is_behind%3F). Repeat with me: "Ubiquity, Ubiquity, Ubiquity…"
Acquires values from environment parameters: temperature, humidity, lightness, presence, pressure or (almost!) whatever you can sense. Operates with these values, when required. Transmits these values using a low power comsumption wireless technology (ZigBee). Sleeps until next timeout and repeats from the first stept. Second step is not always necessary, depending of the calculations needed it may be better to make them in receiver computer to save nodes energy. An open mote? What does it really mean? It means every part of the mote is accessible and can be studied, changed, personalized, … From the schematic circuit to the source code of the programs that are running inside the mote. Who is interested in SquidBee? Anybody who is researching in the environment monitoring field. This is also an educational project so that universities can offer to the students a multi-learning device. With SquidBee people can learn at the same time electronic, programation, communications… and everything in just one device. Who is supporting SquiBee? The board inside SquidBee has been developed by the Arduino team. The communications module wich lets the node transmit through a ZigBee module has been developed by Libelium. Both components are open hardware and they have a really strong community support. A specialized wiki related to SquidBee and the Sensor Networks will be created soon. There, all the Arduino and Libelium tutorials and examples will be shared and other research teams will be able to exchange their knowledge with the community. What can I do with SquidBee? The main concept is: "sense what you want where you want and transmit it". Two configurations of SquidBee? What is it exactly? Using the same board and communications module we have created 2 kinds of SquidBee: the sensor mote and the gateway. The first one is the self-powered sensor mote and the second is the computer USB connected receiver. Unter dem Namen Motomesh Duo hat Motorola auf der Hannover Messe verschiedene Geräte für ein City-WLAN-Netz präsentiert. Außer der englischen Website http://www.motorola.com/mesh/ habe ich über Motorolas "Meshaktivitäten" bisher nicht viel gefunden. Dort gibt es verschiedene Geräte und einen MeshManager zu sehen. In dem Beitrag auf heise.de kann man Motomesh und Motorola einfach durch Freifunk ersetzen, dann hat man das, was Freifunker schon seit Jahren machen. "150 Quadratkilometer" deckt ein Motomesh-Netzwerk ab. Aha. Wie viele geben denn Freifunk-Netze so derzeit her? Ausserdem beim EDV-Buchversand das Vorwort als Teaser…!